Just as tablets have changed the way books will be purchased and read, the future of magazine publishing is also digital. The concept of digital magazines and paginated periodic content is actually more conducive to electronic delivery than a book. However, books were a simple start for digital distribution ~and magazines just didn’t WOW on a 16 shades of grey e-reader tablet device. Digitally delivered magazine issues also build the value and revenue capabilities of the magazine publisher website. Digital newsstands will connect publishers to new magazine audiences just as traditional print magazine newsstands feature top magazines today. The magazine website will always be just one click away and will be a critical magazine brand and user experience element for even the new era of tablet only based magazines. 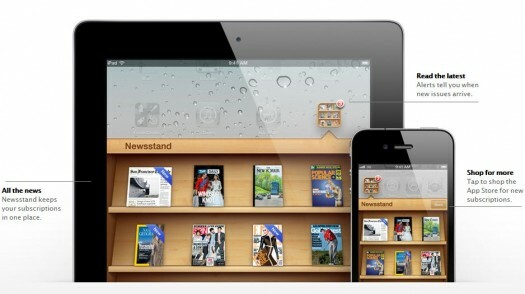 The digital magazine newsstand from Apple(TM) in iOS 5 provides the proper app based usability to iPod, iPhone, and iPad mobile and tablet devices. The newsstand app brings publication subscription functions to a managed newspaper and magazine applications shelf allowing for convenient access & visibility to the most recent publication issues. Digital magazine distribution will grow quickly during the next 4 years and by 2015 all modern magazines will need to have a position in the digital magazine newsstands applicable for the major mobile and tablet reader devices. We expect to see continued value from cross platform magazine app development tools and magazine design solutions. And just as digital magazine software providers begin to promote digital newsstand issue updates as value added services, we will see traditional magazine fulfillment vendors recognize this digital newsstand as a market space where they are well suited to augment their print services. Digital newsstands will provide opportunities for accelerated fulfillment and new value to readers and advertisers. Publishers can track magazine ad performance and readership interaction with the latest news, content, or community at the magazine publication website. And now, even traditional magazine newsstand locations have begun to focus on promoting their tablet magazine edition newsstands. We hope to see open digital magazine newsstands flourish where shelf space is not limited to the largest magazine titles. Thanks for your article. It is true that digital is changing how we think about publications and that every publication will be required to have a digital format in order to survive in the coming years. Google Digital Magazine Newsstand; expected launch 2012 and the publication newsstand should have Apple newsstand and Yahoo Livestand magazine experience features.